Papakea Resort holds the record as the least dense resort on the west side - with 11 low-rise buildings on 13 acres. It has a wide open, uncrowded feel, and offers lots of free and fun amenities, lush tropical landscaping, pools & spas, 2-18 hole putting greens and grassy sunning areas. Rent directly from us, the owners, for the best Value and care. Our one bedroom, one bath condo (#A-202) is direct oceanfront, on the second-floor for privacy while providing exceptionally easy access to the pool and spa below. The 'A' building is the most private and quiet ocean front building at Papakea. It's close to parking, and close to the stairs. There is an elevator down the hall. The building is very close to beach access where the swimming is good. The ocean is only about 15 feet from the lanai! The condo is nicely appointed and fully equipped, with all the appliances and amenities you desire and need. It is one of the few units in Papakea with A/C. Also, there are ceiling fans in every room, including the kitchen! We provide beach towels, a cooler and beach chairs to further enhance your comfort. There is free wi-fi. 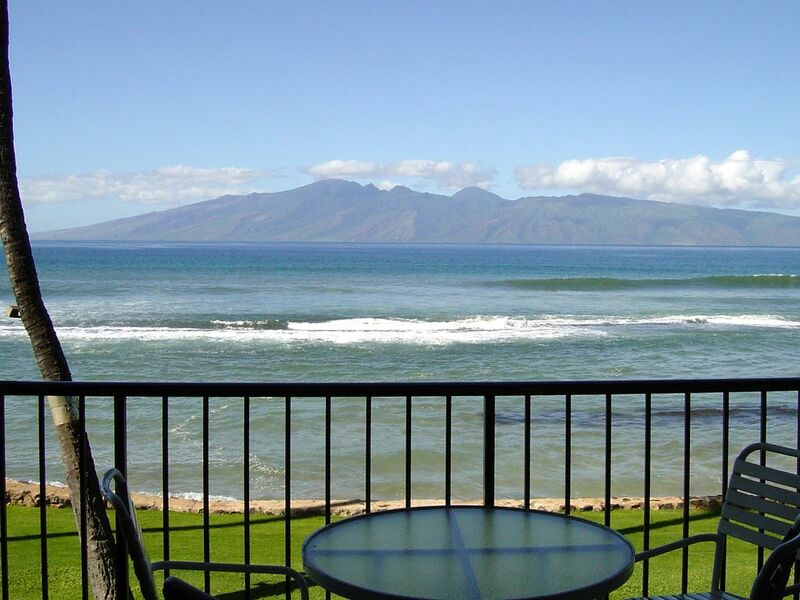 We manage it ourselves and live right here on Maui, so you can easily contact us should the condo require anything. Papakea Resort has great amenities and is within easy walking distance to a big grocery store, restaurants, farmers markets and shops. It's on the north end of Kaanapali Beach, one of the best and most famous beaches of Maui. You can access miles of sandy beach just across the grass and walk bridge to the south. The views from our condo are spectacular! From the lanai and living room, you look directly at the island of Molokai and you also have a view of the island of Lanai to the south. Enjoy the energy, sights and sounds of the ocean and surf so close to you, see whales breeching right in front of you all over the channel (During whale season of course. Bring binoculars for extra close up views!). It's a lovely place to relax, rejuvenate and recreate! * Smoking in designated smoking areas only. * I cannot collect the Papakea ‘Facilities Use Fee’ through HomeAway/VRBO unfortunately. You will pay the Papakea front desk this fee directly. It’s $17/day for the first 10 days of each consecutive 30 day stay. I have lived on Maui for 10 years, my husband has been here about 30 years. He runs a dive shop in Lahaina, Dive Maui / Hawaiian Rafting Adventures, and that's how we met - I did some dives with his shop on my first visit to Maui, in 1994, and the rest is history. For fun, we usually do dive vacations around the Pacific Rim - we've gone to Tonga, Fiji, Indonesia, PNG, Tahiti and Micronesia. We have lots more on the to-do list. When here at home, we work super hard - he in the dive business, and me with the rental properties. We enjoy our three dogs, gardening, and exploring the Hawaiian Islands. When I moved here, my family decided that they wanted to buy some condos at the Papakea (we own 4 now!) and that I would operate the business for them. I love this work! I get a lot of satisfaction out of helping you make the best memories possible each and every time you visit Maui. Amenities: Our condo is fully furnished for your comfort! The bedroom has a King bed and the living room has a very comfortable queen size futon couch. The kitchen has a Jenn-Air range/oven with a grill, a microwave, dishwasher, ceiling fans, A/C, toaster, blender, coffee maker, and supplies. There is a W/D with laundry supplies right in the unit. We supply all bed linens, towels, beach towels, an iron and ironing board, 2 hair dryers, CD player, Cable TV and VCR. We have a lending library for our guests (take one, leave one!). Kitchen soaps and bath soaps, shampoos and lotions are all provided. The condo is furnished in fun Hawaiian style and art. The view from the condo is amazing. We watched whales every day and we also had rainbows several mornings. Great place to stay with everything you need for a wonderful vacation. Resort good, unit not so much! The upkeep of the grounds was perfect. Staff was friendly and accommodating. There were many opportunities existing for interaction among the guests. Fantastic views of the ocean and whales. Our unit was extremely disappointing. It needed a thorough cleaning, painting, and new furniture. Upon contacting the owner of the unit about the dismal state of the bathroom, a new toilet seat was installed. The day before we left the unit, we noticed that the smoke detector cover was ajar. Lifting the cover revealed that there was no battery in the smoke detector. We didn’t bother to check the CO detector. Updating this unit is essential! We know this unit could be better because we had friends staying in a unit in another Papakea building and their unit was newly updated and immaculate. We spent as little time as possible in the unit because it was so depressing. This really colored our stay on Maui. Thank you for your review. I wish you had told me about the cleanliness of the apartment on your arrival. When you called me about the toilet seat, you did not mention any other issues. The housekeepers are on staff, and although they normally do an excellent job, they do occasionally have to come back and do a re-clean. Yes, I have interior painting scheduled, but this is busy season, so you experienced the worst of it I'm afraid. As to the age of the furniture - the bed is a new hi-tech gel mattress, bought in May 2018. The bedroom furniture and some pieces in the living room were bought new in 2017. The 2 high-end recliners in the living room are 3 years old - a Barcalounger and a 'Stressless' brand. I do not have a high end remodel in the condo - just a good basic kitchen update and I keep the appliances and furniture current. It's priced appropriately. The property was gorgeous and perfect! Everything was as advertised, wonderful unit. Floor inside unit was dirty. Glass on end tables looked like could use some cleaning. Aloha Sandy, I am so sorry you did not find the apartment up to my usual cleaning standards. Although I am happy you took the time to write the review, I wish you had told me on arrival or at any point during your stay. The housekeepers are on staff and they could have come in the same day to see to the items you found deficient. By the 4-star review, I hope you found the rest of the apartment and the resort to your liking! Thank you very much for your stay and for the feedback. We lived here for 3 weeks in Bldg A. Great complex location. This is a Very comfortable and clean condo on the second floor. We ate breakfast and dinner on the lanai every day plus sitting there to watch the ocean and Molokai change. The sound of the ocean is amazing. Sleep with the lanai door open. The kitchen has sharp knives and good pans - the bbq’s are clean. Papakea has a great location on Maui and it is beautifully kept. There is an elevator. We enjoyed the hot tubs and pool. Ocean access was easy and right next to our building. Having a washer and dryer in the unit was perfect. Jan, the owner, responded to our questions immediately and we thank her. Be sure to buy Walu at the fish market across the street - marinated in miso - cooked on the bbq. The farmer’s market is nearby and we preferred safeway to Thymes for selection and price. Exploring The Lavendar and Goat farms gets you into the beautiful up country of Maui. A luau, sunset cruise and snorkel cruise are all terrific. We saw an early whale blow from our lanai. Bring your binoculars. Serendipity in the Cannery Mall has beautiful clothing and jewelry not available online. Stay as long as you can. This condo is a wonderful base home for being and exploring. Three tennis courts on site; Tennis Pro available, round robin tournaments weekly; Shuffleboard; 2 18-hole putting greens; 2 pools; 2 jacuzzies; free yoga-lates and water arobics classes throughout the week. Note: Discounts apply for stays of 21+ nights. You can't use online booking for this option. I must edit the quote to get you the discounted rate, so make an inquiry instead of an 'instant booking'. Papakea charges a resort fee of $17/day for the first 10 days of any 30 day stay. You pay this to the Papakea front desk directly - I cannot include it in the VRBO/HomeAway payment, sorry. All cancellations are subject to a $50 cancellation fee. If you cancel 60 days or more prior to your trip, I issue a full refund minus the fee. For holiday season reservations (involving dates between Dec 20th and Jan 5th), the no-refund cancellation window is 120 days, or 4 months out instead of 2 months out. The refund will not include PayPal fees, if you elected that form of payment, as I am not a recipient of those fees. If you cancel within 60 days of your arrival date (or 120 days if it’s a holiday season reservation), the refund is based on my ability to fill your reserved dates. I will refund you as many of your reserved dates as I am able to fill at the rate I am able to negotiate, minus the fee. Your reservation serves as a binding contract between us – me to provide the lodging and you to abide by the cancellation policy.